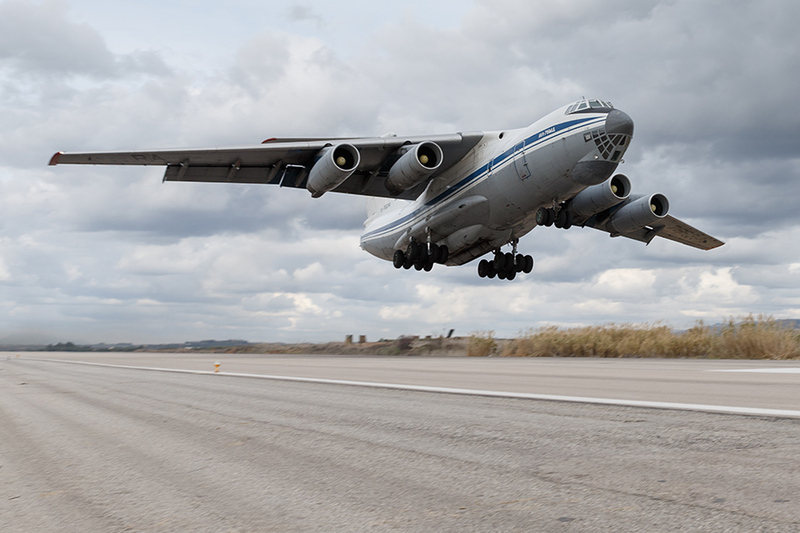 A military transport Il-76 plane at the Khmeimim airbase. The Syrian opposition forces that have joined the national reconciliation process are grateful for Russia's humanitarian aid, Abdel Alhai Gbes, a representative of an armed opposition unit, said on March 21. Harasta, which had a population of approximately 60,000 before the conflict, is situated on a main road connecting the Syrian capital city of Damascus and Homs. Russian-Syrian humanitarian aid has been delivered to remaining local residents, about 4,000 people in total, within the framework of the national reconciliation process. "We already have lots of residents here, but there are still many hindrances to their return. Gas and electric power supply is unavailable and we remain under siege. We are grateful to Russia for bringing humanitarian aid first to Hmeimim and then here, while the Red Cross has been unable to reach us even though we are only a few steps away from Damascus," Gbes said. In his words, local residents refuse to lay down arms because the militants are holding central areas of Harasta. The government will have to provide full security guarantees to local residents in order to make the disarmament process successful, he said. "We need to find a solution to this problem, because we do not want to country to end up in a deadlock. We have lost half of the country, so let us keep the other half. We need to sit down and to solve problem, but a third party, which has been funding the militants, has been obstructing this effort," the armed opposition representative said. In turn, Hasan Habas, a member of the local reconciliation committee, said that most residents in Harasta had been trying to protect themselves from attacks by terrorists. "Armed people have been protecting themselves, their homes and our town. Most importantly, we have no foreign mercenaries here. We are all sons of the Guta district," Habas said. He said he was sure that people would no longer need weapons if they felt safe and had jobs. Officials, among them Damascus Province Deputy Governor Rateb Adas, attended the humanitarian aid distribution ceremony. The deputy governor said that the authorities had been doing their utmost to keep people safe, to bar the terrorists from the town, and to rebuild local infrastructures. "The authorities have been trying to rebuild infrastructures in Harasta, which has lots of local residents and armed groups adherent to the truce. Contact is being maintained via intermediaries, and the army guarantees that security will be provided to everyone and radicals from Eastern Guta will be kept away," Adas said. The deputy governor thanked local residents, who had been doing their best to keep the militants away, and said that the authorities had provided about 400 local children with vaccines last week and were now trying to restore power supply.